General Characteristics. The modern drama, which may be said to date from Christopher Marlowe and Shakespeare, has made liberal use of the Jew as a stage character. From the time of these authors until the present, dramatists have utilized the Jew, either libeling him as a human atrocity, with all the vices of a materialized devil, or, going to the other extreme, making him a perfect man. Few have struck the happy medium and shown the Jew as an ordinary human being. The abusers of the Jew have been responsible, to a great extent, for the popular conception of Jewish character; for they have depicted him as hideous as his bitterest enemy could wish. A varice, hatred, venality, murder, bigotry—in fact, all of the worse passions have been attributed to the stage Jew. In England, in Germany, in France, in Austria, on all stages, the Jew, probably because of his strong personality, has been a favorite theme with the dramatists. Shakespeare, in England, conceived a Shylock; Stephanie, in Austria, a Pinkus, Shylock's opposite; Dugué, in France, Bambaccia, a thief; Iffland, in Hamburg, Baruch, a good angel. Every dramatist had his own idea of the Jew and his character, and represented him accordingly. In England the first of the modern plays to utilize the Jew was Marlowe's "The Rich Jew of Malta" (see Barabas), which was not attributable to hatred of Jews in general, but of one Jew in particular; namely, Queen Elizabeth's physician, Roderigo LOPEZ, who was hanged in 1593 for treason. Lopez was undoubtedly the inspiration for several plays with Jewish villains, which appeared shortly after his trial and death. In 1594 Philip Henslow, the most enterprising theatrical manager of that day, produced two such dramas. "The Merchant of Venice " followed in 1596—a dramatization of the tales of Ser Giovanni, "Il Pecorone," written in 1378 and published in Milan in 1558. The next play was Fletcher's "Women Pleased," the Jew being Lopez, a curious coincidence when Dr. Lopez is recalled. Beaumont and Fletcher's "Custom of the Country" followed in 1628. Zabulon, a male pander, is the Jew in this instance; and a more repulsive creation it would be difficult to imagine. Rutilio, a Christian, is, however, just as disgusting; yet, when Zabulon offers money to Rutilio to debase himself, he refuses the proffered gold with: "Because you are a Jew, sir, and courtesies come sooner from the devil than any of your nation." Before this (1610) Ben Jonson's "Alchemist" had been acted by the king's servants; but the part of the Jew, Abel Drugger, is so innocuous when compared with Barabas and Zabulon that it calls for no special comment. 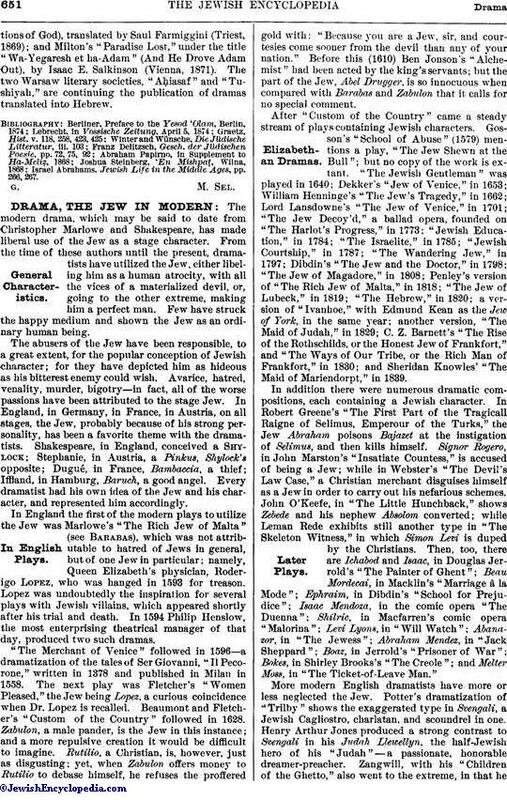 After "Custom of the Country" came a steady stream of plays containing Jewish characters. Gosson's "School of Abuse" (1579) mentions a play, "The Jew Shewn at the Bull"; but no copy of the work is extant." The Jewish Gentleman" was played in 1640: Dekker's "Jew of Venice," in 1653; William Henninge's "The Jew's Tragedy," in 1662; Lord Lansdowne's "The Jew of Venice," in 1701; "The Jew Decoy'd," a ballad opera, founded on "The Harlot's Progress," in 1773: "Jewish Education," in 1784; "The Israelite," in 1785; "Jewish Courtship," in 1787; "The Wandering Jew," in 1797; Dibdin's "The Jew and the Doctor," in 1798; "The Jew of Magadore," in 1808; Penley's version of "The Rich Jew of Malta," in 1818; "The Jew of Lubeck," in 1819; "The Hebrew," in 1820; a version of "Ivanhoe," with Edmund Kean as the Jew of York, in the same year; another version, "The Maid of Judah," in 1829; C. Z. Barnett's "The Rise of the Rothschilds, or the Honest Jew of Frankfort," and "The Ways of Our Tribe, or the Rich Man of Frankfort," in 1830; and Sheridan Knowles' "The Maid of Mariendorpt," in 1839. In addition there were numerous dramatic compositions, each containing a Jewish character. In Robert Greene's "The First Part of the Tragicall Raigne of Selimus, Emperour of the Turks," the Jew Abraham poisons Bajazet at the instigation of Selimus, and then kills himself. Signor Rogero, in John Marston's "Insatiate Countess," is accused of being a Jew; while in Webster's "The Devil's Law Case," a Christian merchant disguises himself as a Jew in order to carry out his nefarious schemes. John O'Keefe, in "The Little Hunchback," shows Zebede and his nephew Absolom converted; while Leman Rede exhibits still another type in "The Skeleton Witness," in which Simon Levi is duped by the Christians. Then, too, there are Ichabod and Isaac, in Douglas Jerrold's "The Painter of Ghent"; Beau Mordecai, in Macklin's "Marriage à la Mode"; Ephraim, in Dibdin's "School for Prejudice"; Isaac Mendoza, in the comic opera "The Duenna"; Shilric, in Macfarren's comic opera "Malorina"; Levi Lyons, in "Will Watch"; Abanazor, in "The Jewess"; Abraham Mendez, in "Jack Sheppard"; Boaz, in Jerrold's "Prisoner of War"; Bokes, in Shirley Brooks's "The Creole"; and Melter Moss, in "The Ticket-of-Leave Man." More modern English dramatists have more or less neglected the Jew. Potter's dramatization of "Trilby" shows the exaggerated type in Svengali, a Jewish Cagliostro, charlatan, and scoundrel in one. Henry Arthur Jones produced a strong contrast to Svengali in his Judah Llewellyn, the half-Jewish hero of his "Judah"—a passionate, honorable dreamer-preacher. Zangwill, with his "Children of the Ghetto," also went to the extreme, in that heexposed the ghetto-dwellers to the light of day with a fidelity which at times is absolutely unpleasant. The other ghetto play, Fernald's "The Ghetto," goes a step further; and its gloom is even more oppressively realistic. France, until the anti-Semitic outbreaks of the last ten years, had treated the Jew more gently than had any other Continental nation. One of its first stage Jews was Shylock, in "Le Juif de Venise"—a translation of "The Merchant of Venice" by M. Dugué. Next came Théophile Gautier's "La Juive de Constantine." Perhaps the strangest play of this character ever concocted was Merville and Maillau's "Juif Errant," produced at the Ambigu, Paris, July 31, 1834. In this play the principal characters are Isaac Ahasvérus, Satan, Simon, The Archangel Michael, Barabas, Louis XV., Jean du Barry, Puck, Ariel, Napoleon, Franklin, Marcus Aurelius, Esther, Rachel, Mme. du Barry, Mme. de Pompadour, Lilith, Death, and The Seven Deadly Sins. It is scarcely necessary to say that it was not successful. Other French plays on Jewish subjects were Anicet Bourgeois' "L'Impératrice et la Juive"; Catulle Mendes' "Les Mères Ennemies" (introducing a rabbi): Désaugier's "Juif" (produced at the Porte-Saint-Martin May 14, 1823); Dumas' "Femme de Claude" (Daniel and his daughter Rebeccah); Dugué's "Salvator Rosa"; Erckmann-Chatrian's "L'Ami Fritz" (the rabbi); and Daudet's "Roi en Exil," dramatized as "La Juive," in which the Leemans of the novel is metamorphosed into an old-clothes man, and his daughter Sarah into Dona Florinde, who plays havoc with the feelings of Don John, of Austria. "Le Juif Polonais," by Erckmann-Chatrian ("The Bells," in English), contains a Jewish character who is not seen, being killed behind the scenes by Matthieu. Germany has been the most prolific of all the nations in stage Jews. The first play to introduce them was the celebrated "Das Endinger Judenspiel," produced in the public square of Endingen in Baden April 21, 1616. It relates the history of a family of Christians who are murdered by Rabbi Elias and his companions. Eight years later their bodies are found, and the murderers are stoned and burned. Next came Gryphius' "Horribilicribrifax," which shows the Jew Issachar as a great boaster. Lessing treated the Jew more kindly in his "Die Juden" (1755), although the Traveler conceals his race to the last. Stephanie's "Der Neue Weiberfeind und die Schöne Jüdin" (1773) holds up to view the pretty Jewess Esther, whom the hitherto woman-hating count loves, but deserts on discovering her race. The same author's "Die Abgedankten Offiziere" (1770), a comedy in imitation of Lessing's "Minna von Barnhelm," deals with Pinkus, a good-natured Shylock. Following this, in 1774, came Pauerbach's dramatization of "The Rural Probity" (published in "The London Magazine." Aug., 1773), entitled "Der Redliche Bauer und der Grossmütige Jude," in which Moses is resplendent as a good angel. This was succeeded by Booger's "Post" (with Moses, a coward). Then came H. L. Wagner's "Reue Nach der That" (1775), in which a Christian causes his dog to bite a Jew, and regrets it later; Plümike's "Volontär" (1775), with a Jew as a jolly soldier; "Der Adelige Tagelöhner" (1776), wherein Isaac helps the poor hero to frustrate the villain, Von Malverse. Müller created an utter coward in Mauschel, the Jew, in his version of "Faust" (1778); but the stage Jew was fully redeemed a year later, when Lessing's "Nathan der Weise" (see Nathan the Wise) saw the light. Next followed Bischoff's "Der Judenfeind" (1780), in which Rachel is killed by her father, Salomo, for the sake of 200 thalers. The year 1781 saw "Albertine," in which Abraham is pictured as a swindler; and the year following, Pfranger's "Der Mönch von Libanon," a refutation and continuation of "Nathan der Weise"; the monk who confounds Nathan being Saladin's supposedly dead brother, Assad. Lerchenheim's "Der Jude, oder Betrug für Betrug" (with Simon, a cheat), and Törring-Seefeld's "Der Teure Ring" (with Abraham), were produced in 1783. In the following year Heinrich Reinicke, in his "Nathan der Deutsche," shows Nathan to be a benevolent type of Jew; and J. K. Latich acknowledged the authorship of "Wer War Wohl Mehr Jude," a plagiarism of "Nathan der Weise," in which Carl Reichert, the banker's son, loves Marie, the adopted daughter of the Jew Wolf. In the next three years German authors produced: "Menschen und Menschen-Situationen" (Karl Steinberg), which also copies "Nathan der Weise," in which Recha, the Christian, is the adopted daughter of Isaac Mendel; "Liebe und Philosophie" (Leipziger); and "Die Lüderlichen," in which Schmül, the money-lender, plays a prominent part. In 1792 Hensler's "Das Judenmädchen von Prag" created a stir, for it portrayed the Jew Isaak paying the debts of a Christian. The same year saw the creation of Ephraim, a comedy rôle in "Weltklugheit und Herzensgüte." Ifiland's "Dienstpflicht" (1795) pictures Baruch as the guardian angel of the poor hero. 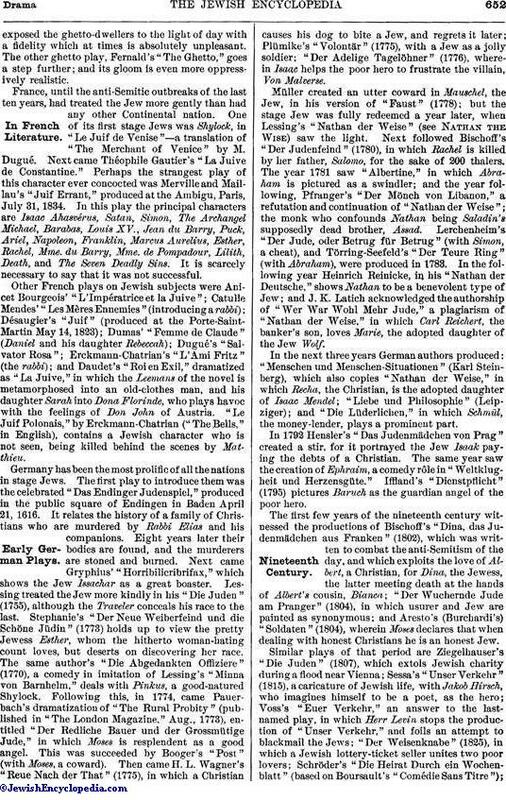 The first few years of the nineteenth century witnessed the productions of Bischoff's "Dina, das Judenmädchen aus Franken" (1802), which was written to combat the anti-Semitism of the day, and which exploits the love of Albert, a Christian, for Dina, the Jewess, the latter meeting death at the hands of Albert's cousin, Bianca; "Der Wuchernde Jude am Pranger" (1804), in which usurer and Jew are painted as synonymous; and Aresto's (Burchardi's) "Soldaten" (1804), wherein Moses declares that when dealing with honest Christians he is an honest Jew. Similar plays of that period are Ziegelhauser's "Die Juden" (1807), which extols Jewish charity during a flood near Vienna; Sessa's "Unser Verkehr" (1815), a caricature of Jewish life, with Jakob Hirsch, who imagines himself to be a poet, as the hero; Voss's "Euer Verkehr," an answer to the lastnamed play, in which Herr Levin stops the production of "Unser Verkehr," and foils an attempt to blackmail the Jews; "Der Weisenknabe" (1825), in which a Jewish lottery-ticket seller unites two poor lovers; Schröder's "Die Heirat Durch ein Wochenblatt" (based on Boursault's "Comédie Sans Titre");"Sie Fehlen Alle" (with Moses, the money-lender); "Spielerglück," in which the son of a Jew and of a French milliner poses as the Marquis de Richesource; and many farces by Richard Voss. Of the newer German productions the best known is Gutzkow's "Uriel Acosta" (1847), based on the same author's "Der Sadducäer von Amsterdam" (1833), which is a play of great power. "Leah, the Forsaken," is another drama dealing with Jewish character. In still more recent times "Heine's Junge Leiden" by A. Mels, which is entirely Jewish—for every character in it is that of a Jew—made its great success because of the sympathetic conception of the youthful poet and the humorous character of Hirsch, the wandering chiropodist and lottery-ticket agent. This play was one of the first, if not the first, to show the Jew of to-day as he really is. 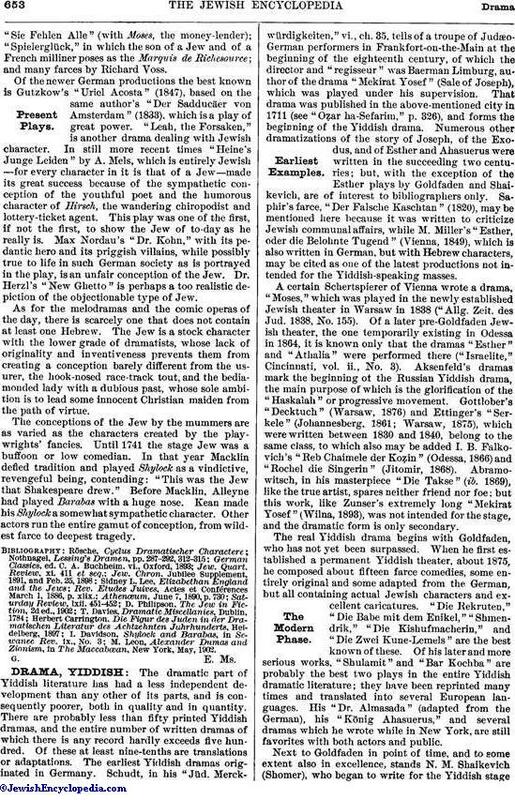 Max Nordau's "Dr. Kohn," with its pedantic hero and its priggish villains, while possibly true to life in such German society as is portrayed in the play, is an unfair conception of the Jew. Dr. Herzl's "New Ghetto" is perhaps a too realistic depiction of the objectionable type of Jew. As for the melodramas and the comic operas of the day, there is scarcely one that does not contain at least one Hebrew. The Jew is a stock character with the lower grade of dramatists, whose lack of originality and inventiveness prevents them from creating a conception barely different from the usurer, the hook-nosed race-track tout, and the bediamonded lady with a dubious past, whose sole ambition is to lead some innocent Christian maiden from the path of virtue. The conceptions of the Jew by the mummers are as varied as the characters created by the playwrights' fancies. Until 1741 the stage Jew was a buffoon or low comedian. In that year Macklin defied tradition and played Shylock as a vindictive, revengeful being, contending: "This was the Jew that Shakespeare drew." Before Macklin, Alleyne had played Barabas with a huge nose. Kean made his Shylock a somewhat sympathetic character. Other actors run the entire gamut of conception, from wildest farce to deepest tragedy. M. Leon, Alexander Dumas and Zionism, in The Maccabæan, New York, May, 1902.